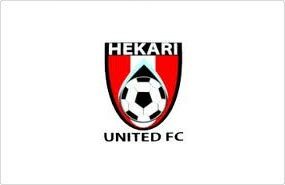 Hekari United’s appearance at the 2010 FIFA Club World Cup is historic. The Papua New Guinea side is the first team from Oceania outside of Australia and New Zealand to win the Oceania O-League and qualify for a FIFA tournament. The club managed this fantastic feat by dispatching of New Zealand’s Waitakere United 4-2 on aggregate in the two-legged O-League final back in May. Founded in 2003 by husband and wife duo, chairman John Kapi Natto and general manager Vonnie Eteako Kapi Natto, Hekari United began play in the third tier of the Papua New Guinea football pyramid. Back-to-back promotions saw the team reach top-flight status in 2005. The club won the first division title in that same season and have never looked back. The Port Moresby-based side have now won all four titles since the creation of the country’s new National Soccer League (NSL) in 2006. Being present and competing at the FIFA Club World Cup is alone an enormous success for Hekari. Having already made history to get this far, anything extra would be the cherry on top of a phenomenal year for this group of ultimate underdogs. Still, despite the modest expectations, this is a team with plenty of belief in themselves and inside the camp the hope is that another upset, this time against Al Wahda, is on the cards. David Muta – Midfielder: Named by Hekari’s coach Jerry Allen as “an important influence on-and-off the pitch”, the impact of Muta, a Papua New Guinea international and Hekari’s captain can’t be stressed enough. Muta is the driving force in the midfield for Hekari, a classy footballer who has long been considered one of the best players in Oceania. Evidence of this can be found in his selection two years back in an all-star Oceania team selected to play against Los Angeles Galaxy. Still only 23, Muta has shown he has a bright career ahead of him. If he performs well in the UAE then not only may Hekari turn a few heads, but Muta could put himself in the shop window for a possible move to a bigger club in Asia, the Middle East, or even Europe. Henry Fa’arodo – Striker: The 28-year-old is one of the few Solomon Islands players to have turned out for professional clubs in Australia. Fa’arodo played for Perth Glory in the inaugural A-League season as well as for Melbourne Knights in the now defunct NSL. The experienced striker knows how to score and is a battle-tested veteran having played in more than 20 World Cup qualifiers for his country. Highly regarded in the region, Fa’arodo was selected to the same Oceania all-star side as Muta was back in 2008. Kema Jack – Striker: The catalyst for Hekari United’s stunning defeat of Waitakere United in the O-League final, the 28-year-old Jack scored a fine brace in the first leg and followed that up with the crucial away goal in the second leg to secure qualification for his team. The Papua New Guinea international led the scoring charts in the O-League with seven goals. This was perhaps no surprise to those in the know as Jack was top scorer in the NSL on three different occasions. Jack is absolutely deadly in the box and will be the main danger man for Hekari United to grab the goals in Abu Dhabi. Jerry Allen: A self-professed fan of Rafael Benitez, Hekari United boss Jerry Allen’s management career may not have hit the heights of the Spaniard’s just yet, but the Solomon Islands’ coach has already engineered one of Oceania football’s all-time greatest upsets in leading Hekari to Abu Dhabi and the FIFA Club World Cup. Allen has put together a good side complete with talent from all around Oceania with a compact defence and explosive attack (19 goals in eight O-League matches). Allen’s expertise in knowing the Oceanian game inside out was evident during the team’s O-League championship run and in preparation for the Club World Cup, Allen has been busy adding some more talent to the side from his home country and from Fiji. One couldn’t explain logically why Hekari United should be picked to do much at all when the 2010 Club World Cup kicks off in Abu Dhabi. The team from Papua New Guinea enter the tournament as the least experienced side and the weakest on paper. Giant underdogs does not even begin to describe their status. That said, this is a side with nothing to lose. While an early exit at the hands of local boys Al Wahda is expected, Hekari possess enough talented players and the right amount of cohesion and unpredictability to have a chance at an upset. It’s also worth considering that this tournament has thrown up a good share of early round surprises in recent years, surely a trend Hekari supporters hope to continue.